It’s the Tuesday after the EMiC Conference on Editorial Problems, and I’m both happy and sad. Sad, because it’s over. Happy, because it was so wonderful to see everyone, share ideas, get inspired, and revel in the community spirit that so defines EMiC. Happy, because now that it’s over, I have time to think through the issues and ideas that came up this weekend and understand how they apply to my own project. Firstly, I’ll point out the change in the title of this series of posts. The first post was titled “Diary of a Digital Archive;” this one is “Diary of a Digital Edition.” Why the change? Well, Zailig is why. As he so astutely differentiated on Saturday, what I’m doing with my work on Anne Wilkinson really is a digital edition. Yes, it is an edition that will include all of the archival source material that forms the basis of each poem, but that doesn’t make it an archive. For one, the scope of my project, and possibly copyright limitations, won’t allow me to digitally publish everything that’s in the Wilkinson fond—there’s one act of selection right there. For another, my edition will, like a scholarly print edition, make choices about what text to privilege as the clear-reading text and how these texts will be organized—another act of selection. Thirdly, my choices as editor will inform what I choose to privilege in explanatory notes and contextual essays, which is subjective and will have significant impact on a reader’s experience of Wilkinson’s work—another act of selection. Zailig—and please correct me if I’m wrong here, Zailig—seems to see our digital projects as being formed by three components, each of which builds on the other. The first is the archive: the physical papers that are held in a library or archive. The second is the database: the compiled digital files that are created from that archive. The third is the edition: the online organization, selection, and publication of those digital files to create a digital edition. So while my change in terminology may be small, its significance is big. Another consideration that came out of this weekend was the incredible importance of project planning. So far, I can only see about two steps ahead: finishing the sorting of the unsorted material and writing the finding aid, and scanning all of the archival material I need. After hearing Emily talk about her genetic coding of Page, and Meagan talk about the second iteration of the Image Markup Tool, I sent Dean an email containing one very basic question: What do I do after the scanning is finished? Or, in an expanded form, how do I go about putting together a project plan that outlines everything I need to do, start to finish, so that I never get to a point where I don’t know what to do next? These are things that we’re going to be talking about at DEMiC in the digital editions course, and at the second week of the newly-revised TEMiC, but I guess I’m just a bit impatient. And as my plan starts coming together, I’ll be sure to share it with all of you. To update you on what’s happening with the sorting of the unsorted archival material, my first day working on it was a bit of a surprise. I got to the library, prepared to be given specific instructions and warnings about not deviating from Fisher’s archival practice. What I actually got was a carrel, some file folders and boxes, and the instructions to have at it. Needless to say, I’ve asked for more specific instruction, and if you’ve got any reading about archiving that I might find useful, I’m taking suggestions. I’ve also begun the organizational framework that I need to have in place before I start scanning (which I’m hoping to do in November). As Anne Dondertman at Fisher warned me in our first meeting, it’s essential to have a strong organizing and file-naming system in place before you start scanning, so that you save yourself a logistical headache later on. I’ve taken this to heart and come up with a spreadsheet that I’m going to use to keep track of my files. 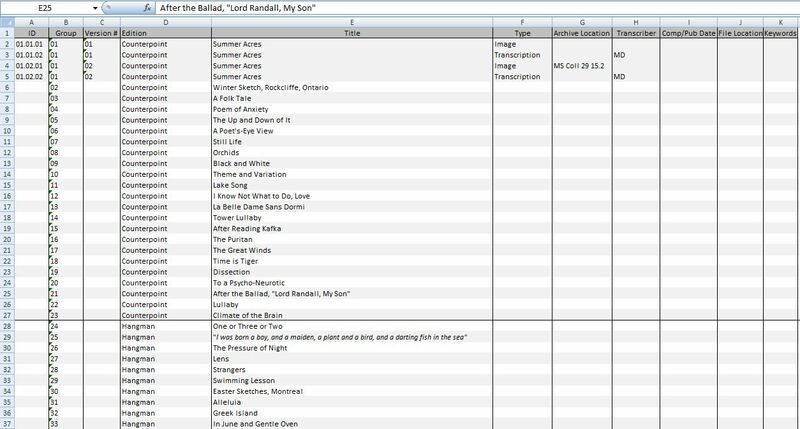 This spreadsheet allows me to give each file a unique identifier, and includes all of the data I should need to keep track of and organize each file. I’m sure there are fields I haven’t though of yet, but I can easily add them later. The ID is unique for each file and tells me three things (taking the first entry as our example): which poem it is (01—the first poem in Wilkinson’s first collection, “Summer Acres”), which version of the poem it is (01—the version published in Counterpoint to Sleep, which Dean takes as his copy text in his edition of Wilkinson’s complete poems), and which file type it is (01—the image file; 02 indicates a transcribed file). I’ve also given each file a group ID, so that I can quickly visually distinguish all versions of a poem. I’ve also indicated which published edition the poem is from, if it’s from Wilkinson’s notebooks, or if it was published only in a periodical, and the location of the file in the archive. I’ve also indicated who has done the transcription (it’s probably always going to be me, but it’s better safe than sorry to keep track of this information), the location of the actual file (which will be somewhere both on my computer’s hard drive and on one or even two of my backup hard drives; I’ll hyperlink this information so that I can call up the files right from the spreadsheet), and keywords that I can use to search for poems. I think I’m also going to try to figure out a way provide information about each poem’s links with other parts of Wilkinson’s papers, like her letters and journals. This will be useful when it comes time for cross-referencing and writing explanatory notes. One question that I posed at the end of my last post seems to have answered itself—how will I limit what I choose to include in my edition? As of right now, I’ve decided just to deal with the poems. It is a bounded and not-too-huge body of work to work with (there are 148 poems, most with multiple draft and published versions), and working on the poems, which I’m already really familiar with, will give me the experience I need to move on to other less-known aspects of Wilkinson’s work, like some exciting undiscovered writing that I’ve found in those unsorted boxes, and one day her letters and journals. More importantly, this is a project that (I think) I can reasonably complete within the time frame of my doctorate. The issue of getting credit for unfinished work, and the institutional pressures to have complete and peer-reviewed publications on your CV for hiring and tenure, was a recurring issue this weekend. My way of working with and around this is to artificially delimit the bounds of my work so that I have something “complete” to show that is not in fact complete. The digital edition of Wilkinson’s poems is just one part of the larger edition of her complete works that I have planned, but I’ll frame it as a discrete entity for CV purposes. It would be nice if we didn’t have to do this kind of “creative accounting,” but hopefully continued discussion and critique of the issue (like that we engaged in this weekend) will start shifting what the institution values and how they (and we) view our work. As I sit down this morning to reflect on the Editorial Problems Conference that wrapped up this weekend at U of T, I find it difficult to generalize about the diversity, engagement and talent of all the various speakers who talked about their various editorial projects, identified problems, and, most importantly, offered some fascinating theoretical and practical solutions to the issues of editing a period in Canadian literature to both regenerate public interest and recover texts that may have been out of print for decades. While this list is by no means comprehensive, I thought I might take a few minutes to distinguish a few things I learned and got thinking about as a result of this conference. I’d love to see what other people were thinking about, and perhaps see this list become collaborative to reflect the very rich conversations, both on and off stage, that accompanied our time together. 1. We have come a long way. Beth Popham, who self proclaims her project as involving basic “dinosaur” technology and frames, was able to suggest how fast things have moved since she and Zailig Pollock independently tackled the works of Behind the Log and the poetry and letters of E.J. Pratt. Her important distinction between the different models of socialization (letters to illuminate poetry vs poetry to illuminate letters) offered a dualistic method of applying McKenzie’s theories about Bibliography and the Sociology of Texts to a digital “complete works” project. 2. We still have a long way to go. Meagan “Steve Jobs” Timney illustration of some of the hopeful features of the new IMT 2.0 taught us about the difficulty of creating new technology, and got us excited about drawing unique shapes around parts of the text to mark them up and edit them in new ways. The role of the image in creating a more transparent editorial intervention into a text combines the power of digitization with a new ability to annotate, moving out of the realm preservation and toward a new kind of scholarly edition. 3. We need to theorize the scholarly edition to better fit our own editorial projects. Concepts such as Dean Irvine’s question about scholarly unfinishedness, Hannah McGregor’s discussion of multiple authorship and editorship, Kailin Wright’s inclusion of both con-text and copy-text and Bart Vautour’s event-based editing are just a few of the ways in which we were offered an opportunity to re-imagine the methodologies and theoretical frameworks that are the starting point of our editorial approach. 4. We need to continue to build on a collaborative model of editing, both across generations and across projects. The mentorship model which was so prevalent in the Sheila Watson and Wilfred Watson roundtable, cropped up across various projects, including in the emerging scholars roundtable, and the two technologies and collaboration panels. When graduate students spoke of their RA work on EMiC projects, the goal was not simply to facilitate the senior scholar’s own editorial goals, but also to provide the tools to encourage independent work by the junior editor. For massive projects that are similar in scope, such as the P.K. Page and Watson projects which are in similar early stages, it became clear that sharing resources and ideas across projects would allow for innovation and a greater sense of efficiency for both works. Workflows and guidelines currently in development by Matt Huculak in collaboration with Meg Timney in the near future will allow for common standards across all EMiC affiliated projects. The EMiC Commons and MiCA Archive (Coming Soon!) will be excellent forums for sharing research between scholars both within and across projects. 5. We need to think about the pedagogical impacts of our editorial work in the classroom. Vanessa Lent suggested expanding our mentorship model into the classroom through experiential learning and scholarly editing practices. Peter Webb talked about the fear of “fromming” in selected teaching texts, while also emphasizing the value of short print editions to encourage the appearance of our work on University Syllabi and in the hands of general readers. 6. We need to think both big and small. For each large recovery project, for Miriam Waddington, Gabrielle Roy, Martha Ostenso and Wilfred Watson, there is also an individual volume for Eli Mandel, Ernest Buckler and Elizabeth Smart. These two recovery models will impact scholarship in different ways, and are particularly affected by institutional support and independent research funding. 7. We need to think in print and online. Many projects combine both print editions and digital apparatus, or distinct print and digital editions. We need to explore in more detail the idea of a hybrid text, as well as determine what the benefits are to using this model to describe these works versus a model in which the two components are separate and distinct. 8. We need to keep thinking about these things together and keep the conversation going. Future conferences, the EMiC blog, workshops, conference proceedings, special issues, classroom teaching, TA meetings, RA meetings, department meetings, Skype, twitter, DHSI, TEMiC and ACCUTE are just a small number of the forums in which we can continue to broach these multiple issues and find common and individual solutions. I want to end this post by thanking, once again, all of the various people who helped bring this conference to life. Thanks to co-convenors Dean Irvine and Colin Hill, University of Toronto and the Conference on Editorial Problems for giving us a forum, Kailin Wright and Brandon McFarlane for accommodations and technology, Vanessa Lent for her incredible administration. To all the others, acknowledged and not in the program for the conference, as well as all the participants and presenters, thank you! I have just returned from EMiC’s fantastic Conference on Editorial problems at the University of Toronto, where the subjects of openness and sustainability, especially as they connect to new forms of scholarship, were a recurring point of conversation. First, a note on the form of the conference. This was a two-day all-plenary conference with organized group meals, as many round tables as panels, and a strong presence of emerging as well as established scholars. Everything about the conference promoted openness in the simple sense of free dialogue in a stimulating and accepting space between like-minded (but not too like-minded) academic folk. In many ways it reflected the ethos of EMiC itself, which focuses on collaboration between emerging and established scholars, experiential learning pedagogies, and the new possibilities for editorial practice embodied in the digital. At the same time, my work with Susan Brown on Sustaining Digital Scholarship for Sustainable Culture (a project funded by SSHRC’s President’s Fund for Knowledge Synthesis Grants on the Digital Economy) has made sustainability a word that I can’t stop noticing cropping up all over the place. This conference was no exception. The trend among the different digital editorial projects discussed this weekend was definitely towards the open: open-access, crowd-sourcing research, bridging the gaps between academic and public sectors, radically expanding the possibilities for engaging with modernist texts in a digital environment. But in the midst of all this excitement, practical questions did arise. Of particular concern to me were Pericles Lewis’ question about the sustainability of digital editions and archives, and Dean Irvine’s question to a panel of emerging scholars about the professional repercussions of working on “unfinishable” projects in an academic environment that privileges a very different mode of knowledge production. It seems to me, having had a little time to reflect at this point, that the answers to both questions ultimately touched on the same theme, a theme that was carried through in the form of the conference itself: the importance of institutional support for new forms of scholarship. Digital editors such as Tanya Clement and Sophie Marcotte are able to push the boundaries with their digital editions because they have the institutional support of libraries and/or archives that agree to house their projects. Emerging scholars are able to spend their limited time and energy on unsual and often unfinishable projects because they have the institutional support of a large project that supports and encourages such work both by pairing emerging scholars with more experienced mentors and by providing them with stipends, RAships and internships. My own ongoing collaborative work with a group of scholars at the University of Alberta is sustained by the university’s willingness to support what we’re doing through resources and infrastructure. I did not begin my graduate studies as a digital humanist (or as an editor or a modernist, for that matter). My work has been pushed to become more daring, more experimental, and much more open through the support of established academics and the institutions that fund their research. This includes Paul Hjartarson’s and Dean Irvine’s support through EMiC (which has included sending me to the DHSI twice now) and Susan Brown’s ongoing belief in drawing emerging scholars into her work, both through our ongoing Knowledge Synthesis project and, on a larger scale, in the Canadian Writing Research Collaboratory. What I wonder, then, is how we can help to sustain these sorts of funding initiatives, how we can encourage institutions and granting agencies to support openness, experimentation, and unfinishedness as qualities of value, and how we can push academia further in this direction, by showing that interesting and valuable scholarship happens in environments that privilege this sort of work. The funny thing about about this program is that no matter how many times I mentioned to people that I was working for EMiC, they never quite remembered what it was all about, or what I was talking about. What’s doubly funny is that I didn’t even really know what I was doing until I took the EMiC class offered in summer school- a class offered through the English department, taught by Dean on Editorial Theory. I had taken one short course with another Emic Project coordinator two years previously, and was really into the material. But it was hazy in my memory, and none of my courses from that point onward covered Modernist literature, Canadian or otherwise. I never read Virginia Woolf in University, that’s kind of a bummer. But I digress. Luckily, beginning the project I was assigned to work with Vanessa on Elizabeth Smart. I had in fact scarfed down By Grand Central Station I Sat Down and Wept. I had also researched her life for a presentation and found her to be so cosmopolitan, so beautiful, so fiery, and so interesting. Essentially my position was to scan Smart’s work into a computer. Vanessa taught me how to do this in a huge scanner in a small room in the library. After this was done I cropped, resized and collated the books into a pdf file of the whole book. I listened to the radio or sometimes knitted while I waited for pages to scan. I hit a new level in the scanning room when I started listening to podcasts of contemporary fiction. But I was pretty bored generally and didn’t think to do anything about it, as is the ignorance of the undergraduate. This was my part time job between September and April-ish of 2009 and 2010. Things changed that summer when I started Dean’s course. It’s difficult to articulate this but I finally understood the project I had been working under for eight months. In this class we read work about the socialization of texts, genetic criticism, problems in editing, the fluid text, electronic textual editing, etc. etc. I fully started to realize how important EMiC’s work was. The project became so full inside my head, the details expanded and became richer, and my enthusiasm for all of it skyrocketed. On one of the last days of class Dean spoke about his thrill in his work, and told the class we should be careful to only spend so much time in what we were personally invested in. I was not personally invested in scanning books. But I now feel so personally invested in the importance of digitizing, editing, and spreading work that has been underappreciated or burned to bits by Elizabeth Smart’s mom. As a member of the publishing industry, the thought that certain sects of literature could die and vanish terrifies me. It was a privilege to work for a person and a project that is not too lazy to just listen to the radio instead of doing something about it. I really feel the EMiC course should somehow be a pre-requisite for working for the project. I felt like I attended a convent (three week summer school intensive) and came out converted into a true EMiC-ite.